First introduced in the early ’90s, Deadpool the comic book character is by no means a pioneer. His look bears a striking resemblance to Spider-Man, and his powers are essentially the same as the X-Men’s Wolverine. But it’s Deadpool’s sense of humor and fourth-wall-breaking that have helped make him stand out. It is that singular element to Deadpool’s character that has both made him a fan-favorite in the comics and made him near impossible to replicate in cinema. Well, that and the excessive violence. Nevertheless, it was only a matter of time before FOX (who owns the rights to Deadpool and almost all of the X-Men offshoots) pulled the trigger on a Deadpool movie. The only question was whether they would get it right. In order to deliver a “true” Deadpool experience, the creators would need to secure an R rating and they would need a very specific tone. Thankfully, this month’s adaptation of Deadpool has exactly that. For fans of the character, Deadpool delivers on every level. It’s funny, irreverent, crass, and occasionally a little sweet. Director Tim Miller and star Ryan Reynolds have brought Deadpool to life without missing a beat, assuming you don’t remember the character’s first incarnation in X-Men Origins: Wolverine. But that’s also the beauty of Deadpool: the character exists in a world where comic book movies have already enjoyed tremendous successes and epic failures. That’s ideal material for a film like this, which can poke fun and parody nearly every comic book convention. That being said, Deadpool is not without its own formula. This is an origin story, so there is the requisite introduction of the character’s abilities, which in this case is super healing; the unveiling of the key villain and hench villains; the comic relief; the epic showdown; and the love interest. However, what Deadpool does well, even with its structure, is subvert expectations by using flashbacks to tell its origin story. See, while most origin stories spend nearly half their runtime building to the big reveal of our fully-formed hero, we first meet Deadpool as Deadpool. Then we travel back to learn how Special Forces agent Wade Wilson was diagnosed with cancer, met and fell in love with a girl named Vanessa (Morena Baccarin), and was given superhero abilities by a mutant called Ajax (Ed Skrein). 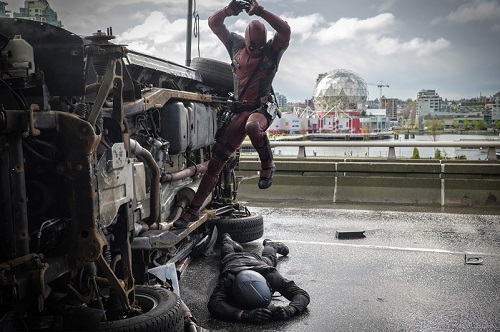 Moving back and forth between present and past is a smart move on the part of Miller and screenwriters Rhett Reese and Paul Wernick because it gives the audience enough time to acclimate to Deadpool/Wilson as a character before the film ramps up to its conclusion. If there is one knock against Deadpool‘s script, it’s that certain elements of the film feel like attempts to offset the intense violence and oftentimes-absurd humor. The love interest plotline gels with the movie just fine, but it definitely feels unnecessary. It’s as if the production needed to bargain for specific elements that would keep Deadpool feeling like a Deadpool movie. Trading a love interest for an R-rating that will ensure female viewers aren’t too off-put, perhaps? In the end, though, what Miller and Co. have put together is something pretty special. A Deadpool movie seemed like a pipe dream a few years ago, but now we have a film that any fan should be proud of. Yes, there are some flaws, but a smart structure, big laughs, some slick action, and a tremendous leading performance give Deadpool enough momentum to carry it through. 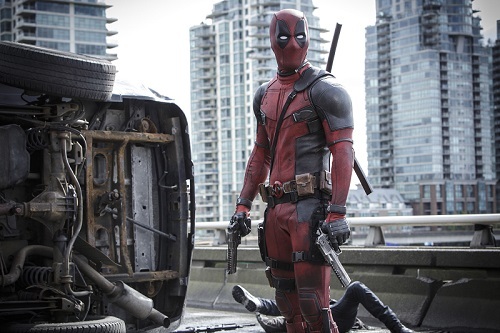 Deadpool proves that if you honor the source material, superhero movies can be great in numerous permutations. On the action front, Deadpool struggles to keep things at an exciting clip. The opening action sequence is well paced and choreographed, but the latter beats lack that same level of punch. The introduction of a few lesser-known X-Men characters, specifically Colossus and Negasonic Teenage Warhead, will carry the die-hard fans through, but it’s hard to argue that Deadpool feels like a lesser Marvel movie in terms of its action. Thankfully, the film features plenty of humor to boost up the lack of thrills. Now hopefully with a bigger budget for the sequel, fans will get the one-two-punch of action/comedy that Deadpool deserves. While most of the superhero movies tend to balance humor with action, Deadpool leans its needle towards laughs more than most. From the very first frame, Deadpool sets a tone of self-referential humor that is carried the entire way through, and it’s all the better because of that. Granted, some of the humor is childish (albeit R-rated), but that’s the audience that this character appeals to the most. He’s crude, but also a bit endearing, and he’s never too far from an obscure ’90s reference. If you’re the type of person who enjoys a little slapstick in their action, Deadpool will have you smiling the entire time.